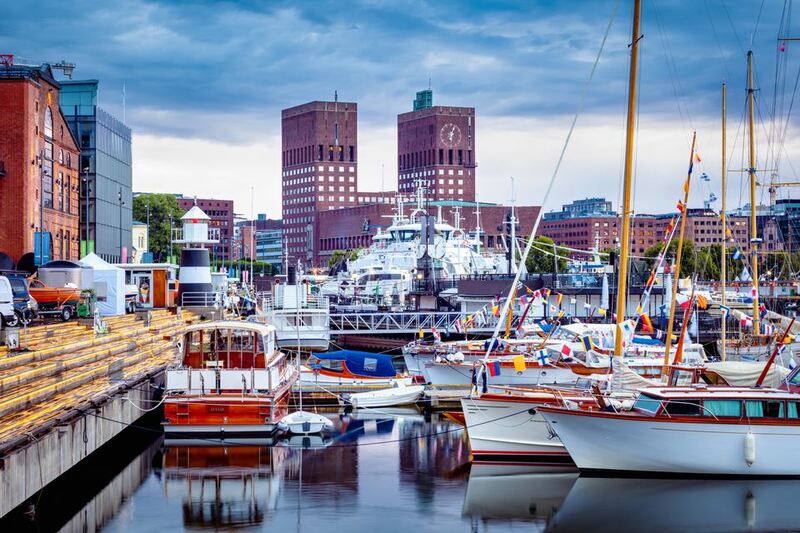 In Norway, Oslo—the country's capital—and Stavanger aren't even 200 aerial miles apart, but getting from one city to another by land takes far longer than expected. Traveling between Oslo and Stavanger isn't exactly a straight shot. There are four different travel options with pros and cons to consider. This is definitely the fastest option. You can hop from Oslo to Stavanger or from Stavanger back to Oslo with a direct, 50-minute flight. Airlines covering the popular Oslo-Stavanger route are typically Norwegian, SAS, and Wideroe with regular flights. When booked in advance, a one-way isn't extremely pricey, and Norwegian Air is typically the cheapest option. Pros and cons? It's quick and painless, but also one of the more expensive options. If you want to relax and have a nice view along Norway's southern coast, use the train from Oslo to Stavanger. The bad news is that the train from Oslo to Stavanger takes about eight hours. But if you have the time for a scenic trip and buy Minipris tickets (Norwegian) in advance, the one-way ticket should be cheaper than airfare. You can make train reservations in advance for this and other Norwegian routes with Rail Europe. Driving is the option for flexibility. If you're renting a car in Oslo (or in Stavanger) and want to drive the 300 miles (500 kilometers) to the other city, know that there are two options that include toll roads and a longer one that doesn't. Either way, the entire drive will take up a whole day, so expect to be on the road for a while. You may also want to consider the time of year for safe driving. In the winter, for example, road conditions can be poor thanks to snow and ice. The quickest option (nine hours) from Oslo to Stavanger is taking the E18 and then turning on to roads 41 and 42 west. From Stavanger to Oslo, first follow road 42, road 41 and then the E18 east. The inland route takes a bit longer (nine and a half hours). From Oslo to Stavanger, use the E134, then road 37, meet up with the E134 again, and take the E39 for the last stretch to Stavanger. From Stavanger to Oslo, simply reverse the route. If you want to avoid any toll roads between Oslo and Stavanger, follow the second route described, but (coming from Oslo) turn onto road 13 going southwest toward Stavanger. From Stavanger to Oslo, head northeast on road 13 first and meet up with the E134 later on. This takes about 10 hours. Nor-Way Bussekspress and Lavprisekspressen operate buses between Oslo and Stavanger. It's a long, 10-hour trip. The bus between Oslo and Stavanger costs about the same as the train, which is faster, more punctual, and more comfortable. So while you can take the bus, it's not the optimal choice.